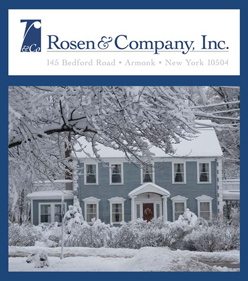 Publisher	Rosen & Company, Inc.
With the leaves still changing amidst a crisp fall breeze, it’s easy to dismiss the prospect of being affected by winter weather. But make no mistake: once the seasons change, each of us is as vulnerable as the next. Being a mindful and caring homeowner – and taking steps to prepare for severe winter weather before it happens – can help reduce your exposure to weather-related events and minimize possible damage to your home. Clean the chimney flue.Over 15,000 chimney fires occur annually. Service your oil furnace to prevent a “puffback” explosion. Keep your thermostat at 60 or above to prevent frozen pipes. Ask someone to check your property if you are away for more than a few days. Clean out gutters and downspouts of leaves and debris to prevent “ice dams” from forming. Be cautious with temporary heaters. Never leave them unattended, keep them away from drapes, furniture, and walls, and be sure the area is adequately ventilated. Check the age of supply hoses to washing machines, dishwashers, icemakers, and air conditioners. Turn off all exterior faucets including garden hoses, dry sinks, or outdoor kitchen sinks. Winterize exterior irrigation systems to prevent freezing. Consider installing Low Temperature Sensors to alert your alarm company when interior temperature drops below freezing. Consider a backup generator capable of servicing your home when power is lost. Install explosive gas leakage detectors, which can alert your alarm company. Install carbon monoxide & smoke detectors, particularly near sleeping areas. Insulate your attic (with proper ventilation) to avoid heat escape. Consider an automatic water shut off system and make sure everyone in the house knows where the main water valve is. Keep the driveway clear of snow so that fire trucks can pass easily. Clear heavy snow loads off the roof to avoid roof failure or collapse. Engage an arborist or tree professional to keep trees properly pruned and prevent falling branches from damaging property. Sara Rosen is the Executive Vice President of Rosen & Company, Inc. For more information about Excess Liability and other insurance, please contact Rosen & Company at (914) 939-1200, sjrosen@rosen-co.com, or visit us on the web at www.rosen-co.com. Personal Excess Liability: What If?